Taipei has night markets filled with stinky tofu, oyster omelettes, mysterious things on a stick, shaved ice and drinks filled with boba. While there are no night markets on this side of the ocean, we have our county fairs filled with equally fried, equally weird, equally delicious goodness. I've never been the OC County Fair, but we decided to check it out a few weekends ago after hearing about it from some friends. It seems closer than the LA County Fair out in Pomona and we ended up being there for 8 hours, riding the roller coasters and giant slide, picking up a set of keepeez lids and getting slightly sunburnt wandering the fair. I was on the hunt for funnel cake. I love funnel cake and since it's pretty much the combination of being sweet and fried, it's right up my temptation alley. For some reason, I ended up getting it from a vendor with a huge pink sign, and it was the wrong call. The funnel cake with strawberries and whipped cream came out a bit too quickly for being fried-to-order and tasted like it was probably fried awhile ago- lukewarm and not crispy. It did have a pile of fresh strawberries and addictive whipped cream, but I should have complained and taken it back to ask one be freshly made. Perhaps it was an excuse to try funnel cake somewhere else. Walking around, I was in awe of all the things that were offered up as fried. 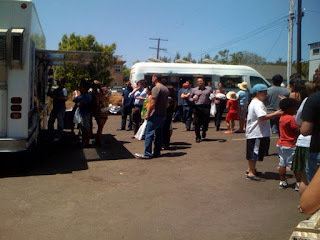 It was like a live version of the thisiswhyyourefat.com- fried smores, fried twinkies, fried oreos, fried white castle, fried avocados, krispy creme doughnut burgers, zucchini weenies, fried artichokes, huge turkey legs, and... fried frog legs? Ewww. When my sister ended up joining us later in the day, she and her friends vowed to sample as many of the crazy fried foods as possible, so of course I had to steal a few bites. The fried smores tasted pretty much like tempura batter- I couldn't really taste any chocolate inside or marshmallows. It was a big gooey mess. The zucchini weenie was surprisingly tasty- I guess the vegetable part of it makes it less unhealthy? I then pointed her toward the vendor that I had thought about trying, but thought was too expensive (I think it was around $10)- Mexican funnel cake. What makes it Mexican? Instead of regular batter, they make it like a super long Möbius strip churro. And I have to admit, the Mexican funnel cake tasted pretty fantastic. It was huge enough to share with at least five other people- and this was the regular size- there's a bigger jumbo size. Make sure to also get the apple fries. I've never had apple fries before, but they were like eating the good stuff straight out of an apple pie, but slightly crispy with powdered sugar. And if you're curious, you can also pick up some chocolate covered bacon from the vendor bringing you the Mexican funnel cake. There were a few long strips in a chinese take-out box, chilled and looking like regular chocolate. Taking a bite, I tasted the crispy saltiness inside the chocolate and it was a weird savory, sweet mixture of flavors. I had a lot of fun at the OC County Fair despite paying $6 for a giant ICEE and other hiked up amusement park prices for food and drinks. There was a Dasani flavored water booth near one of the entrances and they were giving out free bottles if you tasted their water and filled out a short survey. They also had a free petting zoo and elephant and pony rides. Lots of rides for adults and kids and lots to eat. I think they have special promos on certain days, you can check their website- otherwise it's a $10 admission fee for adults. Were there any must eats that I missed? It ends on August 9th, so there's a few weeks left to go back and try some of the other things before I leave the world of funnel cakes and back to the world of stinky tofu. Mmmmm. 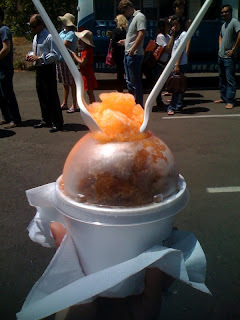 I don't know why there isn't Hawaiian Shaved Ice in Taiwan, but it would be the perfect extension to the already popular top-it-with-anything shaved ice places in Taiwan. Sweet, fruity and colorful, I headed to the trucks at T-Lofts on Olympic after finding about Get Shaved's Shave Ice from twitter. After looking at the extensive menu, I decided on Root Beer, Strawberry and Dreamsicle (Orange + Vanilla). 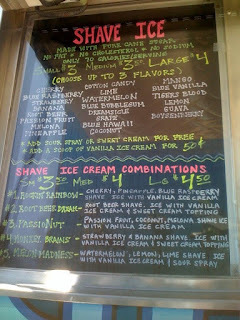 I loved how the ice was finely shaved (rather than chunky) and the flavors were sweet but distinctive. It started to melt as we were waiting in line, so I had to eat it quickly. 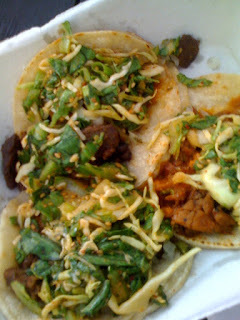 I had already eaten lunch so I was took a tiny bite of my friend's tacos. It was different than I expected- I thought the meat would be sweeter and there would be kimchi, like my own little experiment. Instead there was some spicy shredded lettuce atop of the diced and grilled meat. There was no sweet and savory combo. Unfortunately, I'm having trouble uploading pics from my camera to my computer... so until then, all pics are from my iPhone. Foie gras and warm molten chocolate lava cake. Drool, drool, drool. Both decadent, melt in my mouth dishes that make me happy. With those two things on the menu, everything else just faded into the background. Not to mention that I'll always remember Ben Teppanyaki for giving me the biggest piece of foie gras I've ever had. EVER. It's hard to tell from the pictures how huge it was, but it was crazy. With teppanyaki, you watch the chef cook everything in front of you, making it look easy- letting things rest at the grill, putting the right amount of oil and seasoning to bring out the flavors. And in past experience, things are diced and sliced and passed around the table, so often if you see a few lobster tails, the amount that gets back to you is only a portion. That's why when he put the hunk of foie gras on the teppan, I thought it was going to be split amongst the table. But no, it was ALL for me! No complaints, except from my arteries. It was so good and worth it, as I took each quivering, succulent bite. Definitely needed the sauce and the sweet pear to offset the richness of the foie gras. Good thing the veggies were next- I needed to balance out the meal with some tender asparagus and mushroom. The juices from the mushroom were hot and as I munched away, I wished there were more. I arrived late to the huge family dinner at Ben Teppanyaki so I didn't get to see the menu, but there was plenty of seafood and steak around the table (shrimp, fish, lobster). I'm guessing that this meal didn't come cheap, but it was worth it! Ben Teppanyaki seems to take French dishes and serve it teppanyaki style with an elegant flair, fusing an east west menu. As the four generations laughed and talked, I played catch up with dishes- a pumpkin soup; garlic bread; cubes of steak with crispy, thin slices of garlic, and fried rice that I had to pack to go. I think there were more, I can't remember- all my focus was on the foie gras. When the dessert arrived, I had mixed emotions. I love chocolate cake, but I was pretty full. Then warm chocolate sauce broke free from the cake when I sliced it with my fork and made a little pool for the vanilla ice cream to take a dip. I devoured the whole thing- I couldn't resist! If you're planning on coming, make sure to save room for dessert! What is more important? First impressions or last impressions? If it's first impressions, Truva gave us great first impressions. The waitress (and owner?) patiently went through the extensive menu with us, explaining different things and making recommendations. The restaurant was smaller than I expected, but elegantly designed with rich colors and a prominent bar. The restaurant was nearly empty when we arrived for dinner, but it gave us a more private feeling. But if it's last impressions, well, let me know what you think. Some reviews I had read about Truva complained about the bottled water charge (that they serve bottled water without asking and then you are charged for it), so I was prepared for that- it's pretty common in a lot of the nicer restaurants in town (and nothing could be worse than the one time my friends and I ended up paying US$40 for just Fuji bottled water in Vegas when we didn't know we were getting charged by the bottle rather than by the person). Instead, I happened to catch multiple charges for pita bread on the bill (it was complimentary as part of the appetizer as well as the shrimp dish) and the waitress apologized and looked like she was going to fix it. But then the owner came back and said something along the lines of, "I gave you extra pita bread with your appetizer. It usually comes with 1, but I gave you 3." Ummm... Wait a second, if he gave it to us (rather than us requesting it) then isn't it a gift aka free of charge? I was a bit annoyed, but we paid the bill rather than debating with him. I had raised the point and he made his. It couldn't have been more than a NT$160 charge, but the more I thought about it, the more it bugged me. As you might remember, I don't like it when the restaurant "upsells" you with a smile without a heads up. Eventually it left a bad "aftertaste" in my experience on the meal and restaurant, which was too bad because there is some decent food at Truva. The pita bread in question was good. Turkish pita bread is different than pocket pita bread that you might picture from the more familiar Greek pita bread or pita sandwiches. It was soft and chewy and went well with the mixed dip plate that we got with creamy hummus, eggplant (mashed and grilled) and spicy vegetable salad (with tomato, onion and parsley). If I had to do it over again, I wouldn't order the mixed pita(NT$560) and the baked shrimp casserole(NT$620)- both were overpriced for what you are getting. The mixed pita was the least favorite of the table, a bit dry and bland with an overcooked egg. And the shrimp in the casserole seemed to be frozen rather than fresh shrimp, and just too expensive for the portion. The sauce was a bit oily and the shrimp themselves didn't seem to have been marinated for long. Instead, check out the mixed grill (NT$860) with turkish meatballs, lamb shish kebap, chicken shish and adana kebap with sides of rice pilaf and french fries. My favorite from this plate was the grilled chicken- it was the most tender and juicy. and the beef Iskender (NT$760) with slices of rotisserie grilled beef in a thick, sweet tomato paste sauce and huge portions of yogurt and pilaf on each side. This was a crowd pleaser at the table. I think at one time maybe people would pay a premium for an "exotic" food like middle eastern or Turkish food. But now with the growth of the casual chains Doner Kebab and Sababa, I can get a filling and equally delicious entire meal and drinks for two or three people for the price of one entree from Truva. I'd be curious to see how differently priced the lunch menu is- maybe there are some deals to found there? Otherwise, for the value of what we got, it's hard for me to see myself going back, with so many options to eat around town. But if you're looking for new place to romance a date or try something new like Turkish ice cream, the fine dining ambiance can definitely set the mood. headed to LA: what to eat? Headed back to LA this week! Very excited about trying out all the places I've been reading about on the LA food blogs, as well as eating at my neighborhood favorites. I've packed my laptop, business cards and photos so I'll try to do some catchup posts while I'm away.. lots of catching up to do. SIGH! Otherwise, I might send some snapshots of what I'm eating in LA. So LA readers, any places I gotta try this time around? Help a hungry girl out! Happy 4th of July! This year was the first time I ever celebrated July 4th in Taipei, much less with a full on bbq on a grassy lawn! Much thanks to my friends J and A for inviting me over and making all the rib fingers and grilled pineapple chicken sooo delicious! Grilled bbq corn, potato salad, cornbread and then fruit and brownies (my small contribution) for dessert. Yum! I'm totally going to start grilling up some pineapples now on my George Foreman grill (he he) and buying the Stubb's bbq sauce from Costco. What are you guys eating on your 4th? And does anyone know where to get sparklers in Taipei?